When Anna Szylar of the Adam Mickiewicz Institute in Warsaw invited us to come give a lecture and talk to artists, we had no idea what to expect. We had never been in Poland so we gladly accepted the adventure. 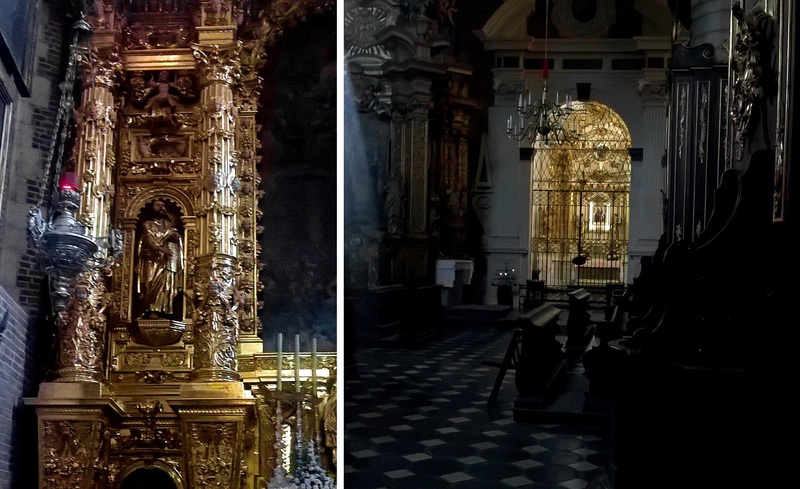 When we mentioned our Cathedral-in-the-Clouds project and a desire to see Memling’s Last Judgement triptych in the National Museum of Gdańsk –nowhere near Warsaw– she promptly organized a tour of some of the most prominent churches and cathedrals that took us to four major cities spread across the country. 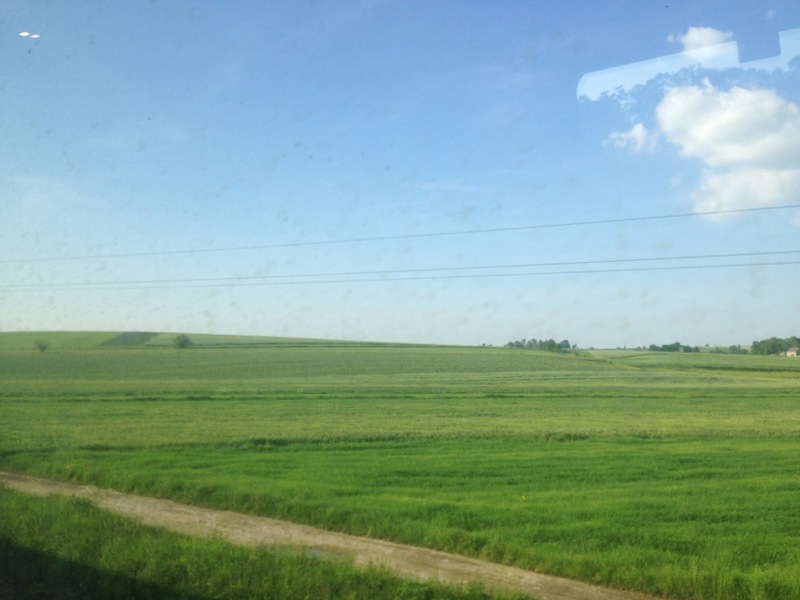 In seven days, we would spend 14 hours on trains cruising the idyllic Polish countryside. It was extremely worthwhile! Polish landscape outside of train Windows XP. Our trip was quite well organized. Anna had taken care of everything: flights, train rides, hotels. She even set up interviews with press and meetings with artists in different cities and arranged for two very nice guides to accompany us on our journeys. A taxi was waiting for us at Warsaw Chopin Airport. Unfortunately, he dropped us off at the wrong hotel. Serves us right for not speaking a word of Polish and not checking our documents. But luckily our actual hotel was only a ten minute walk away and that gave us a first opportunity to get acquainted with the capital’s busy boulevards. We met Anna at the hotel, had a quick bite and were immediately escorted to the Academy of Fine Arts for our lecture at noon. We talked about art and cathedrals and cyberspace and had a little Q&A afterwards. After a short interview for a local podcast in the sunny courtyard of the academy, we were hurried to the Adam Mickiewicz Institute, the organisation behind this adventure, to present our project to its director, Paweł Potoroczyn, and his staff. 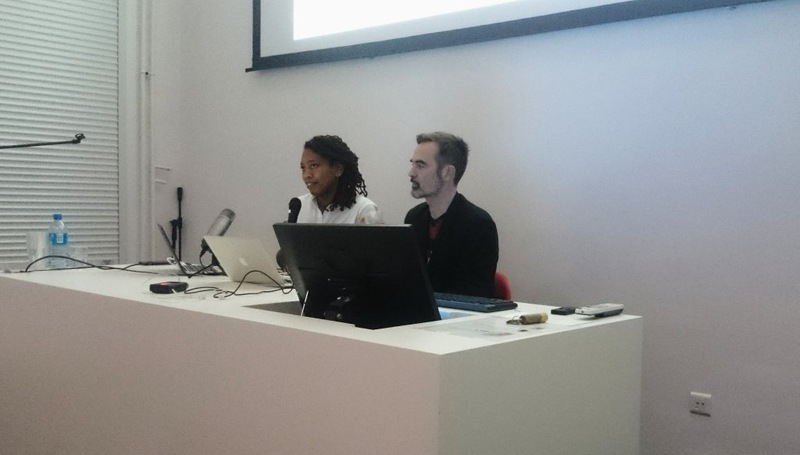 Auriea & Michaël presenting in Warsaw. Then it was time to relax on the terrace of Charlotte, a popular local café hangout, with a bottle of Prosecco. After all, it was Auriea’s birthday! Included in our little party was Paweł Schreiber of Jawne Sny fame. He must be one of the people most knowledgeable about games that we ever met. Also joining us was artist Karol Komorowski who subsequently took us to his apartment-gallery to see some artworks by himself and some other young artists, and teaching us how to ride the Warsaw trams for free in the process. What a day! We had barely seen anything of this country but we already felt surprisingly at home. Sweet weather, friendly people –most of whom spoke English very well– with a delightful combination of sincerity and humor. But we had been up for a long time and were happy to have a “typically Polish” dinner in a cute pseudo-rustic restaurant around the corner of our hotel, called Chłopskie Jadło (which as it turns out, translates to “Peasant Food”). It wouldn’t be the last time that we ate food named in common with the greatest patron of Cathedral-in-the-Clouds (Maciej pancakes this time, although we recommend the Zrazy meat rolls too). Menus in Poland tend to mention the weight of a dish, which is very helpful for chosing a meal that matches one’s hunger. Our guide, Antek Burzyński, came to meet us at the hotel the next morning and explained how to actually pay for public transportation on our ride to the train station. After three hours on the train (comfortable seats, electrical outlets) we arrived at what instantly felt like a seaside town, even though the train station of Gdańsk is nowhere near the water. In fact, the only water we saw while we were there was that of the Motława river. We dropped off our luggage at a newly built hotel in an area seemingly only recently discovered by civilization –construction everywhere. On the ride into town, Antek got into a serious discussion about politics with the taxi driver of which we didn’t understand a word. The Polish had just elected a right wing government and this was causing some tension among the people. Skipping lunch because the museum closes at 5, we headed straight for the art through the blistering heat of the Gdańsk streets. The National Museum is a fairly modest red brick building (we would learn that brick had been a favorite material in Poland, even for churches), beautiful and peaceful. Memling’s triptych is proudly presented on a place of honor where the visitor is immediately confronted with this masterpiece of the Flemish Primitives. We learned that the reason why The Last Judgment is in Gdańsk at all was that a pirate stole it from a ship to its Florentine commissioner and the city simply held on to the treasure. Thieves had good taste back then! We had reread the Book of Revelation on the train ride here to prepare for this experience. Although nothing really can. Memling’s Last Judgment is completely overwhelming. We spent more than an hour exploring its intricate detail and discussing the meaning of all the symbols and colors. And wondering why the face of the saved man in the archangel’s scale was so badly conserved. 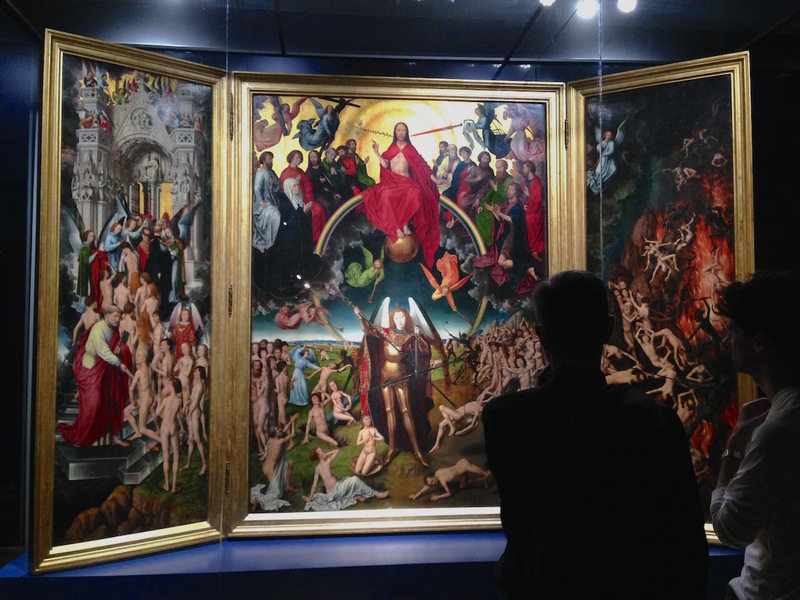 Michaël and Antek exploring Memling's Last Judgment in the National Museum of Gdańsk. In reality the painting feels a lot bigger than it looks in this photo. The experience filled us with so much inspiration for Cathedral-in-the-Clouds that we almost immediately wanted to head back home and get to work –without seeing any of Poland’s temples (which would have been a huge mistake). There’s more to see in the National Museum, too, and we did manage a small tour of the collection before our stomachs forced us back to the meticulously restored (since it had been bombed in World War II like so many places in Poland) center of town to get at taste of a local specialty: humongous filled baked potatoes. Some strolling along the river, American ice creams and clever cocktails later, Antek decided to take us to the Monument to the Fallen Shipyard Workers in the harbor, on foot. It was dark when we arrived at the site that was plastered with both Solidarność and Catholic Church references. The monument itself, consisting of three tall crosses with anchors, reminds of mount Golgotha where Christ was crucified. What a preparation for our tour of Polish cathedrals that would begin the next day! The moody Monument to the Fallen Shipyard Workers in nightly Gdańsk. The next morning, we head back to the massive brick structure that we had already passed by in our wanderings about town. But today we enter the Basilica of the Assumption of the Blessed Virgin Mary or Saint Mary’s Church in Gdańsk. Surprisingly, the church felt smaller on the inside, which is the exact opposite effect of the Gothic designs that we’re used to in the West. We decided that this was caused by the lack of flying buttresses. In this and several other churches we visited in Poland, the side aisles are as tall as the central nave. In the West, usually, the nave is much taller, and supported by buttresses flying over the roofs of the aisles. Like many places we would visit, the church had suffered greatly from the war and was restored in a peculiar way: the walls and ceilings painted completely white and functioning as a backdrop for the colorful religious ornaments, altarpieces, statues and the odd gigantic clock. This way, the building felt more like a museum than a temple. But what a museum! Beautiful art and craft with great attention to detail. Many of the polychrome statues have an endearing naive quality, but are very original in design. 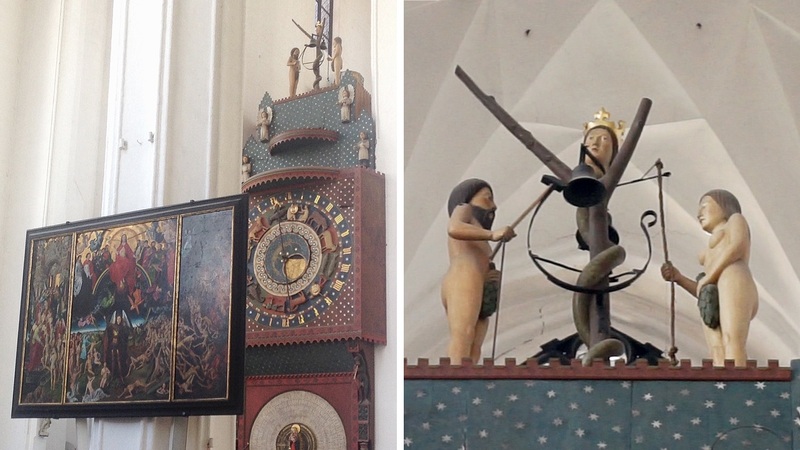 A charmingly painted reproduction of Memling's altarpiece and an impressive clock/calendar crowned by quite an original Garden of Eden scene in Saint Mary's Church in Gdańsk. We 3D-scanned one of the "museum pieces" in the church. Makes one wonder about this angel's original context. Maybe we can give him a place in cyberspace. The grand Basilica of The Holy Trinity, Blessed Virgin Mary and St Bernard in Oliwa or simply the Oliwa Archcathedral was also painted white on the inside but marks the start of our bewildering encounter with the exuberance of Polish baroque (and mannerism and rococo). 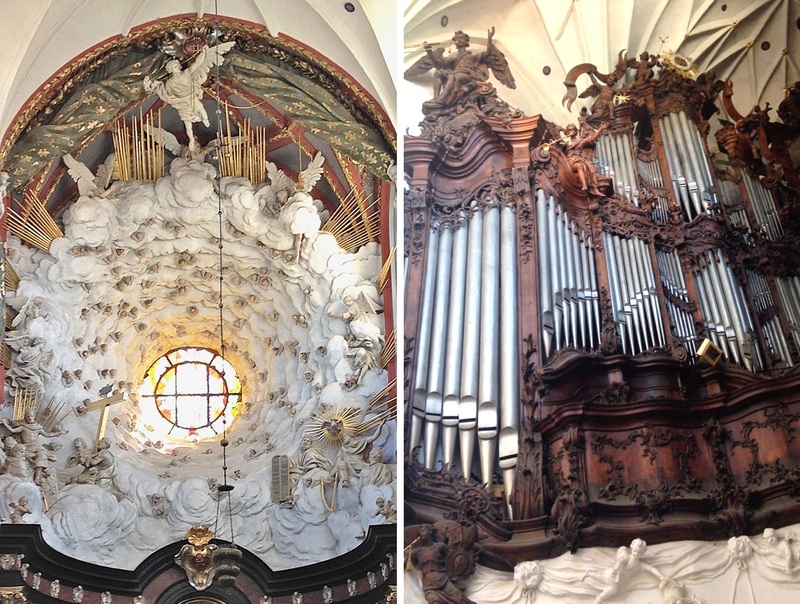 We have had our fair share of baroque architecture and art. There’s quite a bit of it in Flanders and some years back we followed Bernini’s trail through Rome. But Poland was different. If the baroque ever deserved to be called excessive and eccentric, it must be because of the enthusiasm with which Polish artists (and their patrons) embraced style. The choir of Oliwa, for instance is smothered by a massive pack of white clouds (much to the delight of your cathedral-in-clouds builders, of course) littered with cherub heads (nowhere in all our travels have we seen as many flying babies as in Polish temples!). A small oculus allows the light of the rising sun (we were there in the morning) to flood over this wonderful simulacrum of the heavenly realm. It’s mad, it’s exhilarating! And then you turn around and find the west wall covered by the intricate wooden sculpture that is the church’s pipe organ. Lucky for us an organist decided to demonstrate the instrument by playing some tunes from then and now. When he did –no idea how- the sculptures started to move! Angels waved their trumpets around and little suns circled as the sound of bells was heard. Makes one wonder what impression this must have made on the generations before electronic media! Would such a frivolous, kinetic, spectacle really have aided devotion? 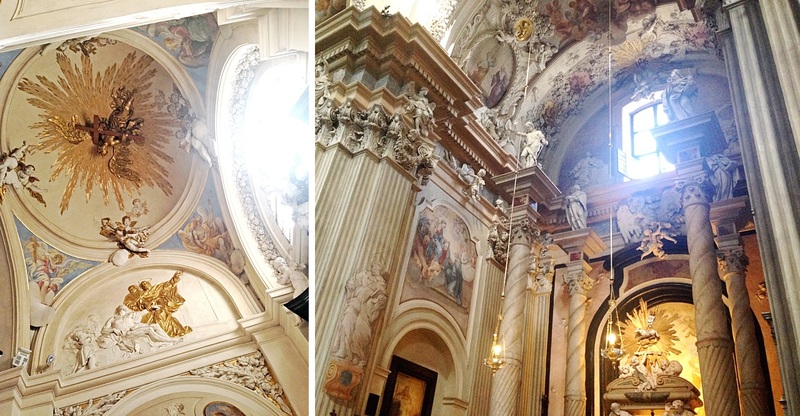 The glory that is the east and west walls of Oliwa Archcathedral in Gdańsk: Well hello, Baroque and Rococo! Exhausted from all the splendor, our bodies welcomed the 6 hour train ride that would take us to Kraków. Sadly our guide Antek had to leave us in Warsaw. But we were met by Piotr Kubiński on the train tracks when we arrived. He promptly took us to the oddly luxurious Qubus hotel (five huge palm trees in the lobby! ), where after switching rooms twice (once because there was no double bed, a second time because the new room was already occupied –oops!) we ended up on the seventh floor with a splendid view of the Wisła river and the lively Kazimierz district that we would explore that evening (we later learned how the area behind our hotel had been the Kraków ghetto where the famous story of Oskar Schindler happened, and that Kazimierz still has a very Jewish character). Michaël has been having some back nerve issues that cause such extreme pain sometimes that staying in bed in the early morning is not an option. Walking alleviates the pain, so in Kraków too, he got up and went for a walk. After an espresso in a truck stop and discovering that the cemetery he saw on the map was a wonderful semi-forest with ancient Jewish graves haphazardly among the trees, he ended up back in a now much more quiet Kazimierz and discovered that the doors to the Corpus Christi Basilica were now open. It was Sunday after all. The privilege to be alone in a beautiful church on Sunday morning! This is a small church but it is completely covered with decorations in dark wood, much of it gilded. The wealth of the church interior is so overwhelming that it makes a mockery of money. Abundance. No single person can ever own all of this. It is of us all. A nice introduction to the rest of the day when we would discover exactly what it meant for Kraków to have been the capital during Poland’s Golden Age. Cherub heads rising up a column. The church's designers seem to be trying to express what faith feels like to them. A chapel was added in a different style, with different colors. Light radiates from it into the dark church. When we officially got up Piotr Kubiński took us to a wonderful book store in the center of town for an interview with Piotr Sterczewski of Biweekly magazine. The journalist had played many of our games and asked some very interesting questions (yes, this is rare, sorry). After this we started our tour of Kraków. We were ill prepared. Apparently there are 120 churches in Kraków. And we thought seeing four in the four hours we had before our next meeting was cutting it short. But how are we to resist the beckoning portals on practically every street corner? You see, Kraków had not been damaged as severely as many other places during the war. Maybe this is why the city felt immediately comfortable to us: we’re used to surroundings filled with testaments of past centuries. The first church that we visited was not on our list. But we’re so glad we saw it! The church of Saint Francis of Assisi is a beautiful ancient gothic affair but many of the walls had been redecorated at the end of the 19th century. Not in the neo-gothic style that was still going strong then but it a highly original variety of art nouveau. We had never seen such a thing before: church walls covered with organic motifs and patterns of flowers, plants, fruits, feathers, water, and so on. Truly marvellous! Art Nouveau and Gothic peacefully and harmoniously united in Saint Francis of Assisi in Kraków. Next onto the former palace complex to see Wawel Archcathedral. This is a very touristic area. So there’s more marveling at the gold than pious devotion going on here. Oddly it’s not allowed to take pictures inside. When we arrived at Saint Florian’s church there was a service going on. So we sat down in the very back and watched. The service was in Polish but its structure was similar enough to the services we have attended at home (for research and enjoyment: sadly, we are not religious) for us to follow along (standing up, sitting down, etc). Except that two men and two women were sitting kneeling right in front of the altar. One of the women was holding a baby. A baptism was going on! Such a moving moment in, yes, another glorious church glistening with gold. The church was practically empty excepted for the family of the child, most of whom were sitting in the choir taking pictures of the ceremony with their cell phones –a procedure that continued after the service with all taking turns holding the baby and posing in front of the altar. Nobody had an actual camera. We didn’t use ours either. Who wouldn't want to have their child baptized amid such glory? The emotions had left us starving. But God must have figured that we needed a baptism ourselves first. Piotr guided us through a virtually tropical shower (we had been warned about Kraków’s unpredictable weather) to his favorite burger place where we ate the biggest hamburger in the universe. It was a mess! Having satisfied the body, we felt ready for more spiritual nourishment. The Church of Our Lady Assumed into Heaven is another brick gothic building. 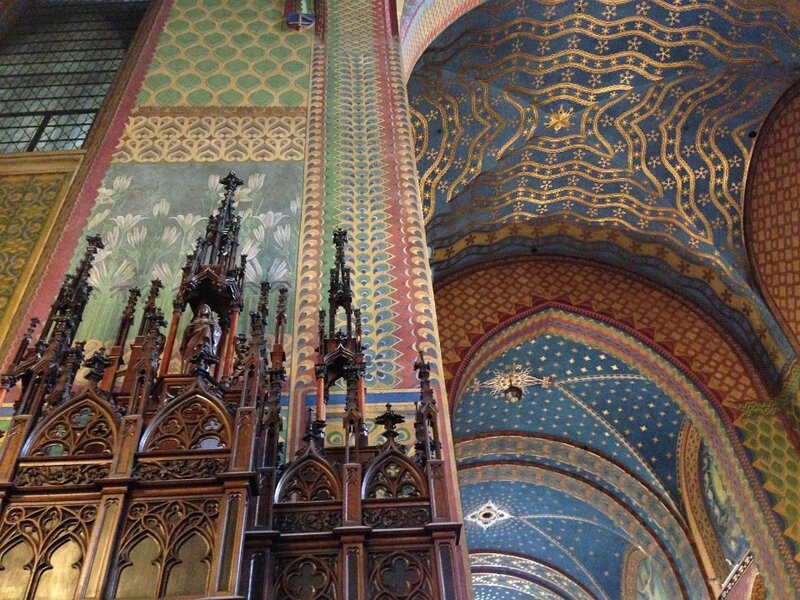 But the interior of this one is not baroque but 19th century neo-gothic! You can tell neo-gothic from actual gothic because neo-gothic looks more gothic. Neo-gothic is like the design-version of gothic, where everything is done according to a well-defined aesthetic plan. And what a feast for the eyes this spectacle is! Saint Mary’s is also the home for Veit Stoss’ gigantic 15th century polychromed altarpiece. Sadly the top part was invisible, presumably while being restored. Despite the many visitors Saint Mary's Basilica in Kraków retains its dignity as a house of worship. From Mary to her mother, the Church of Saint Anne also pulled us back into the baroque. And how! Not just some baroque additions to an otherwise gothic edifice, but top to bottom, left to right, front to back baroque. A very feminine baroque at that, appropriate for its dedication to the mother of the virgin, with lots of floral decorations and pinks and pastels. And equally fitting with the theme of supermother, the church decorations contained so many cherubs and putti that it almost felt like a celestial nursery. Luckily there were also many grown up angels to take care of the kids. Yes, this is baroque at its best: theatrical, spectacular, narrative, dramatic. Angels everywhere in Saint Anne's Church. Notice the saints high on their pillars and the glorious lamb of Revelation, sitting on a cloud. Everything is afloat here! We had arrived at the end of our list of scheduled visits but our guide Piotr knew of a few more nice churches. So next we went to Saints Peter and Paul's, also a baroque monument, but, appropriate to its dedication, in a more masculine, solid style. Lots of black marble and gold on stern white walls. The church was dedicated to Peter and Paul but all of the apostles were hanging out in front of the church. The arcane symbols of moon, star en three-legged sun wheel still mystify us. But that only makes them more enjoyable. 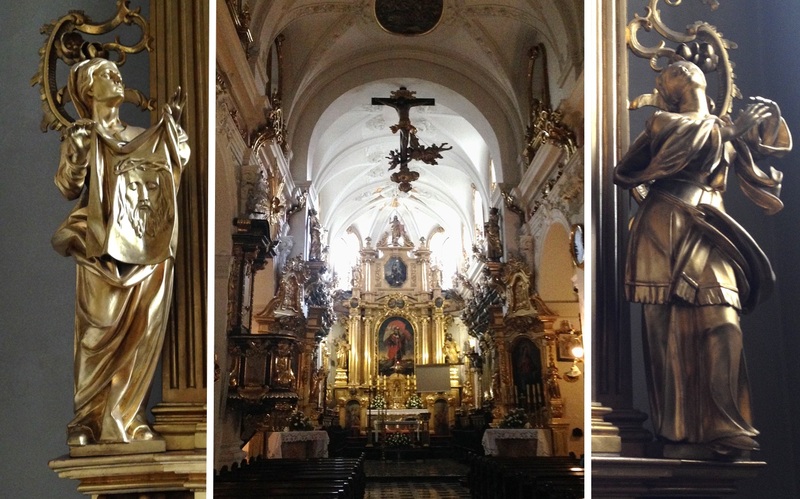 As a final test of our proverbial tolerance for kitsch, Piotr took us to Saint Bernardino's. Typical for a temple of a certain religious order, the church’s design is very consistent. But it seems like this one was so wealthy they didn’t know what to do with all their gold. Nature didn’t even provide enough resources, so they invented their own marble patterns. Still, one can only really be quiet in the presence of such abundance. There’s a nice lesson here: take things so far over the top that mockery would ridicule itself –if only by sheer redundancy. There's a golden angel with a sword flying high above the altar. And a silver one on a cloud demonstrating the latest in fake marble. Michaël and Piotr are awestruck. Six churches in one day (seven for Michaël): a new record! But that was enough. We said goodbye to Piotr and made our way to the greenhouse-like terrace of Bunkier café to meet with Elwira Wojtunik of Elektro Moon Vision. As it turns out, she wanted to talk about Patchlab, a local digital festival that she directs. This year’s edition focuses on VR and after we explained Cathedral-in-the-Clouds, she invited us to come present the project in October. We couldn’t have been more pleased! We had fallen in love with Poland, and Kraków with its familiar feeling mix of old and new in particular. We wanted to come back. And Elwira offered us the perfect opportunity. She left us very intrigued about the digital art scene in Poland, which we would find out more about the next day, in Wrocław. But first we had a rest on a park bench. The old center of Kraków is completely surrounded by a park. So it feels very green and open. And right when we were reaching some blissful high about having found the ideal city, a drunken man approached us, explaining that he had been drinking all day long but had run out of money and if we could give him three złoty so he could buy another beer. At least he was being honest. Next a young woman with an old-school, towering, mohawk on her head bummed a cigarette from us, followed by two more punks. It was all good-natured, cigarettes for everyone! In the evening we walked along the river to Forum, an abandoned brutalist hotel, unfortunately covered up by a gigantic advertisement for a mobile phone provider. The place was packed, inside and especially outside. There must have been well over a thousand youths in beach chairs enjoying the semi-permanent pop-up bar that had invaded the ground floor. We had hoped to get a pizza there but suddenly felt very old. So we headed back to Kazmierz for an amazing Italian dinner. In the train station of Wrocław we were reunited with our first guide, Antek Burzyński. Since we were not going to stay the night, we left our bags in lockers in the train station. Antek took us to a sort of 1980s revival lunch place, cleverly called Bar Bara, where the chairs you sat on to eat were part of the exhibition. On our way there, he pointed out a remarkable modern cathedral, which turned out to be a car park. But we decided that that was probably appropriate after all. 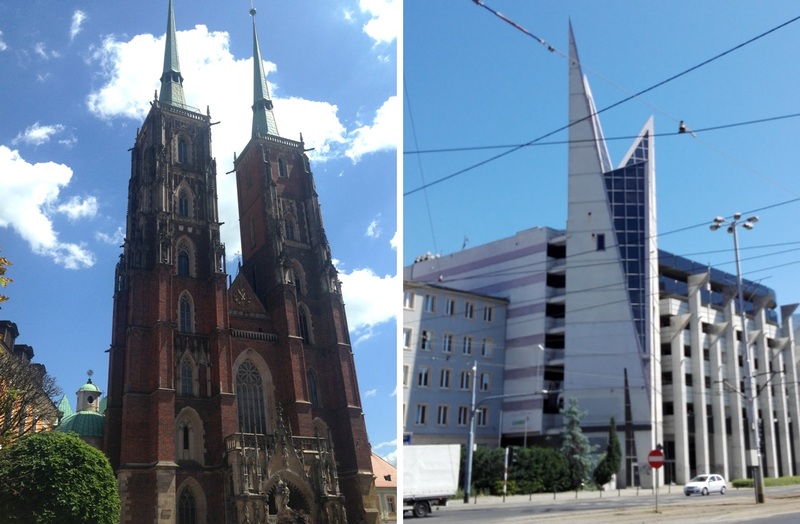 Two cathedrals: one for God, the other for cars. We headed out to the Cathedral of Saint John the Baptist, a building that carried the testament of the long history of building and rebuilding typical of many churches on its facade with mixed brickwork and limestone. Inside we found gothic majesty augmented by some elaborate baroque side chapels where we ended up spending most of our time. 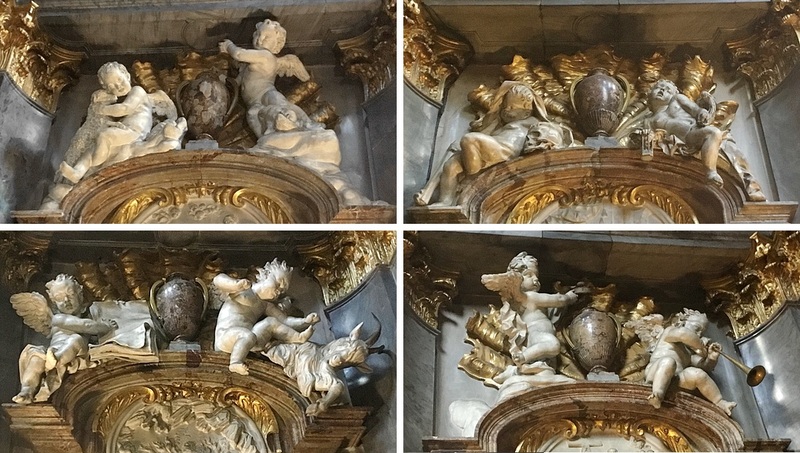 The four doors of one of the baroque side chapels were headed by some very lively cherubs. Detail of Saint John the Baptist in Wrocław. Another saint that is very dear to us, for obvious reasons, is Michael the Archangel. Sadly his church was closed that day. So we only saw it from the narthex. In the center of town we visited another “museum-church”, Saint Elizabeth's, seemingly dedicated to bravery in war, oddly at odds with the expectations of peace and modesty usually associated with the church. But it was time for our meeting with Paweł Janicki at WRO Art Center anyway. Zapping from ancient history to up-to-the-minute technological art, we were introduced to a small art exhibition about the hopes and imaginations triggered by technology centered around some of Buckminster Fuller’s ideas and featuring pieces by Paweł himself too. When we sat down for a drink, he explained that WRO’s main project is a gigantic biennial for digital art. From the catalog of the previous edition it looks very impressive. Since we’ve abandoned games, we have been developing an interest in showing our work in physical contexts too. And since one of the themes of the next biennial in April is work-in-progress, we hope we get to present our Cathedral here as well. Meditating on video gardens and turning our skulls into loudspeakers at WRO. We wanted to grab a bite before our train leaves and we did quickly, because there wasn’t a lot of time left. We ran to the station, collected our bags and made it just in time. Back to start. We only had one appointment on our last day in Poland. But before that, there was time to visit the National Museum of Warsaw where we were blown away by the medieval art collection. So many great works packed closely together, evoking the atmosphere of a church while hanging the altarpieces so low that you can see them much better than you would have in their original context. Showing sculpture together with painting made total sense since many of these pieces combine the two anyway. They even had a few very nice Flemish paintings. We made a 3D scan of this beautiful medieval madonna in the National Museum of Warsaw. By now we could find our way around in Warsaw a little so we walked towards the Adam Mickiewicz Institute where we were going to be interviewed on video, stopping for some fancy designer sushi on the Sushi Zushi terrace along the way. After the interview we realized that we hadn’t visited any churches in Warsaw. Agnieszka, who had interviewed us, pointed us in the direction of the old city, recommending some places. So far we had only witnessed Big City Warsaw, with its grand boulevards, social realist buildings and hip bars and restaurants. The old town? So that’s where all the tourists are! Frankly, we don’t remember visiting Saint Anne's church very well. We needed some time away from gold and marble now to digest all to strong impressions and gather our thoughts towards our own work. But yes, Poland has been an amazing discovery. We didn’t know much about the country before we left and the rude Polish construction workers in Belgium didn’t do much for its attractiveness. But we came, we saw and Poland conquered our hearts. How could we not love a place where city squares are adorned with statues of poets? This journey will certainly have an impact on Cathedral-in-the-Clouds, and possibly, god willing, on part of our lives as well. We’re very much looking forward to go back. Thank you Anna, Antek, Piotr and Mr Mickiewicz! Compliation of video shot in the churches of Gdańsk and Kraków. Browse the entire photo album of our trip.